16th century plaster carvings make this house truly unique, its a historic treasure! Enjoy the breeze on the rooftop terrace! Star gazing on the rooftop at night is incredible! Fresh fish is always on the menu! Sunset on one of our many beaches is always a beautiful way to enjoy the day! Amu House is a fully restored 16th century Swahili house with 7 comfortable, self contained guest rooms each with its own veranda on the two upper floors. We serve a full breakfast downstairs in the historic original Swahili house, and have a beautiful breezy rooftop with a hammock and day beds for all our guests to enjoy. Conveniently located just a minute's walk from the jetty and the seafront, Amu House is perfectly situated. A quiet, private home in the middle of a historic paradise! Amu House on Lamu Island is located off the coast of Northern Kenya. The breezes of the Indian Ocean and the islands of the Lamu Archipelago offer many beautiful places to visit. Sailing is a big part of our culture, and we recommend that our guests explore the area by land as well as by sea. Perhaps a simple day trip to one of our incredible nearby beaches may be the perfect way to relax on your holiday. Or take a sailing trip to snorkel and/or fish with lunch included; enjoy a beautiful sunset cruise with drumming and singing on board, or take the time to explore the nearby islands as we can take you on a variety of exciting sea adventures! And if you prefer to stay on land, relaxing on the rooftop and enjoying the breezes in the hammock may be the perfect way to spend your afternoon after getting "lost" in the maze of Lamu's streets. With no cars or vehicles, only donkeys for transport, spend the morning winding through our historic town, stumbling across pieces of an ancient culture meeting the modern day. Lamu Town is a place history can come alive in your imagination. Feel the ancient times that passed by. Our historic 16th century house has been operating as a Bed and Breakfast for many years. You have to option of renting the entire house for a large gathering of family and friends, or you can rent a private bedroom and meet others also traveling in the area. There are many common spaces available through out the house, in addition to 7 large, comfortable bedrooms with their own verandah space. Feel free to close yourself in or intermingle with others. Breakfast is served in a common space downstairs, between 8 and 10am. Dinner can be arranged in advance tho we encourage our guests to sample the many incredible restaurants on the island. We have a very welcoming manager at Amu House named Kesh. He can help arrange and guide our visitors as they make plans to enjoy their holiday. You will start your day with a full, healthy breakfast, and then let your adventures begin! We encourage our guests to explore the island, and will help support you with ideas and recommendations through out your stay. There is always a person on site at Amu House, available day and night to help with any questions or concerns. Lamu Island is a historic trading center dating back to the 9th Century. 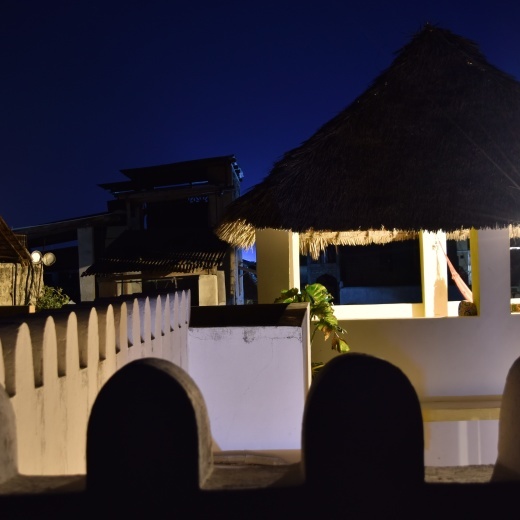 Amu House is a traditional Swahili house dating from the 16th century, located in the heart of Old Town. Just a minute walk to the seafront, with ocean views from the rooftop, Amu House provides a perfect place to start exploring this beautiful historic area. Come join us! You can arrive in Lamu by plane or by bus. 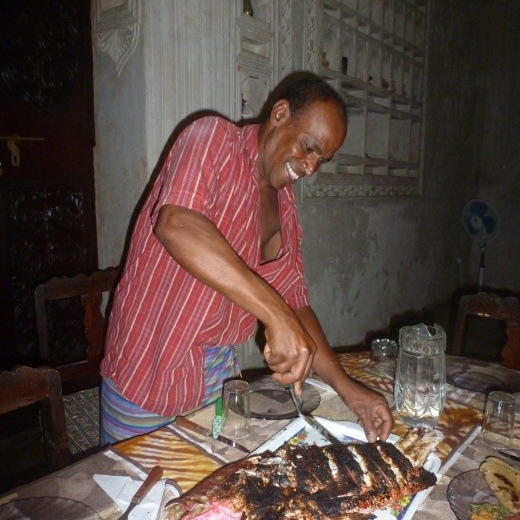 Flying to Lamu from Malindi or Nairobi, you will land on nearby Manda Island where our Manager Kesh will come meet you. Additionally you can come by bus or private car, arriving in Mokowe, where we will also come meet you. Either way, you always make the last leg of your trip to the island by boat, a perfect way to begin your holiday!